The Menai Indoor Sports Centre is a fantastic indoor sporting facility where you can learn all different sports in a fun and fantastic environment. 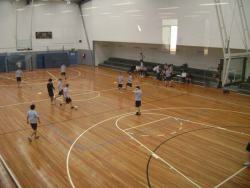 Learn basketball and futsal (indoor soccer) all year round. We also have badminton, volleyball, gymnastics and martial arts classes. There is a wide range of sports available at Menai Indoor Sports Centre for children and adults alike!